Ceviche is an extremely popular coastal seafood dish in Central and South America. It is made with raw fish that is “cooked” in citrus juices (lime or lemon) and spiced with aji (chili peppers). It is often mixed with onions and served with complementing sides, such as sweet potato, lettuce, corn, avocado or plantain. 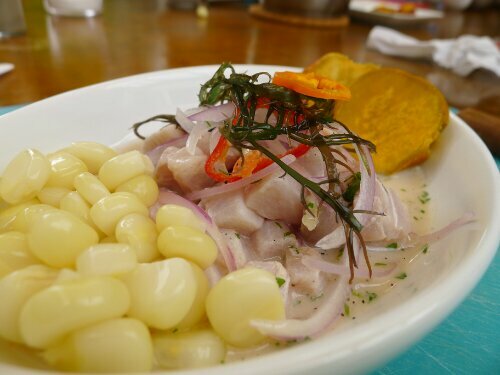 The origins of ceviche is most likely from Peru some 2000 years ago. During Incan times, natives had marinated fish in chicha, an Andean fermented beverage. Most likely the predecessor to this dish was brought to Peru by the Spanish (specifically Moorish women from Granada), who brought from Europe citrus fruits such as lime. 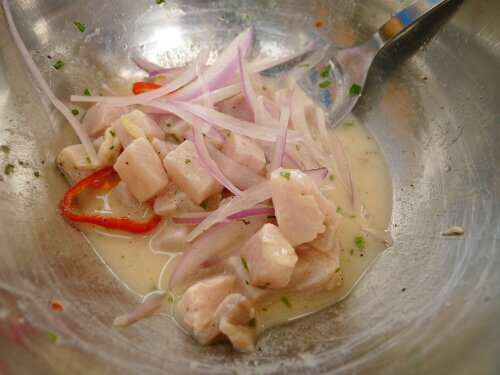 When I traveled to Peru, I sampled some of the best ceviche I have ever tasted in Lima. 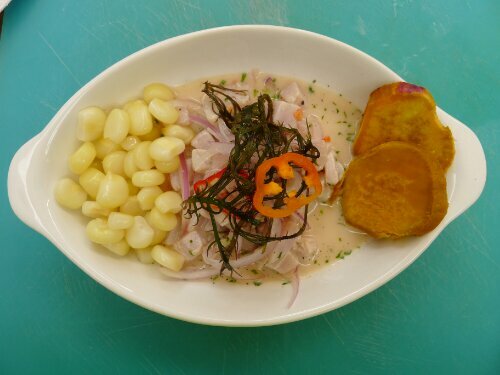 I also got the chance to make the dish myself during my Peruvian Cooking Class – Dinner. When choosing fish to make ceviche, it is important not to get any fish that is too fatty or dark in color. The latter is more for aesthetic reasons as the citrus juice will turn the fish an unappealing gray color (hence Peruvians do not often use tuna). You should ensure to buy sushi-grade quality fish. 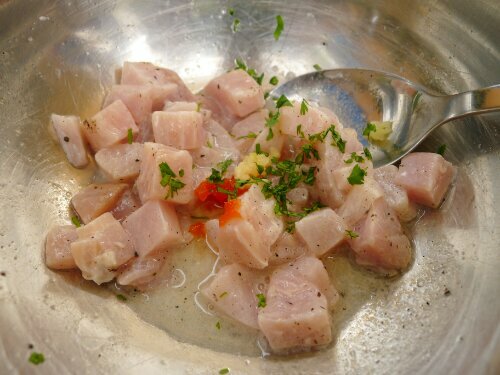 Don’t forget to drink the leftover ceviche marinade even after the fish is eaten! This leftover marinade is referred to as leche de tigre (tiger’s milk). Peruvian men consider it very testosterone-y to down this spicy mixture, sometimes mixed with vodka. It is also considered a great cure for hangovers. Remove all skin and spines from the fish filet. 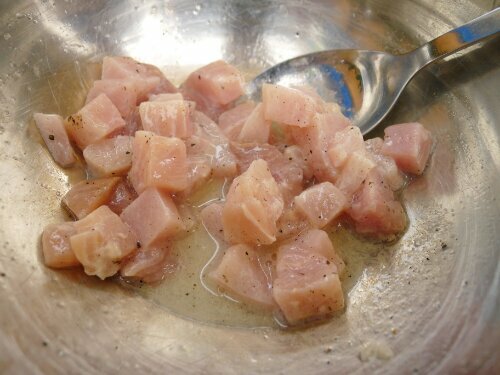 Cut the fish into strips and then into cubes that are about 1 ½ cm in size (½ inch). Put fish into a bowl, add salt and the lime juice, stir and let sit for a minute. Add 6 tbs of the fish stock, chili, garlic, cilantro and parsley and stir. 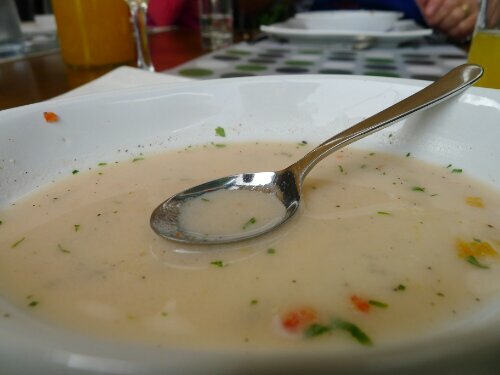 The fish stock helps reduce the acidity of the dish. Finally add the evaporated milk, stir again and taste the marinade. Add more chili if you like. Add some onions slices to the mixture. Put fish on the center of a plate, making a heap. Leave the marinade in the bowl. Put the rest of the onions into the marinade, stir and put them over the fish. Do the same with the Yuyo seaweed. Finally pour as much of the marinade over the fish as you like. Cut sweet potato into 1cm slices and put them in a corner of the plate. Remove the kernels from the corn cob and put in another corner. Alternatively, cut entire corn cob into 4 pieces and add to the plate. Add the roasted cornnuts. Enjoy!